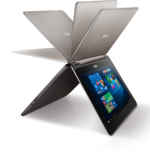 Model: The Asus Transformer Book Flip TP200SA-DH04T is a 2 in 1 convertible notebook with 4 different modes: tablet, tent, stand, and laptop. It has 11.6 IPS HD touchscreen with 178 degree viewing angles. This device is powered by an Intel Braswell N3050 dual core processor with a base clock of 1.6 GHz and a maximum clock of 2,16 GHz, 4 GB of 1600 MHz RAM, and a 64 GB Solid State Drive. This may prove to be a frustration as the user has less than 40 GB of free space. The device uses WiFi 802.11ac, which is up to 3 times faster than 802.11n. It weighs 1.188 kg for the device itself. Asus has included a 5 MP rear camera and 2 MP front camera. The Transformer Book Flip TP200SA-DH04T comes with 12 months warranty. Asus estimates that user should be able to use the device up to 8 hours on battery. Bluetooth V4.1 and USB ports are available for media transfer. A micro SD card slot is present in this notebook as well.